Its always fab when the new season Lookbooks come out and the S/S edition is one of my faves. Lighter fabrics, brighter colours and the excitement of the new and fresh. Curvissa have just brought out their new Plus size fashion lookbook and asked me to pick my favorite pieces and I was very happy to oblige. I chose the Junarose loose print trousers and matching short sleeve top because I thought they looked absolutely gorgeous and I wasn't disappointed when they arrived.The print is great and the blue shade makes it look very striking. I am wearing the size 20 in both the top and the trousers and the top is very true to size. The trousers fit but they are a little bit small so if you are between sizes consider sizing up.That said they have an elasticated waist which gives them a nice neat look and best of all pockets-you know how I love a pocket. I think this actually looks like a cute jumpsuit which makes me love it even more. The shape of the top and trousers work so well together, there is always the risk that outfits like this will look like pyjamas but this looks great. No one has offered me a Horlicks yet anyway. I have chucked on some low heels, a clutch bag and I am ready to throw some serious plus size fashion shapes. This being a challenge (I love that these challenges really just mean I pick some banging clothes and wear them, ha ha) some other blogger babes have also taken part. Pop on over and show them some love too. I was asked to mark this outfit out of five. Its definitely 5/5 for me as I feel amazing in it. 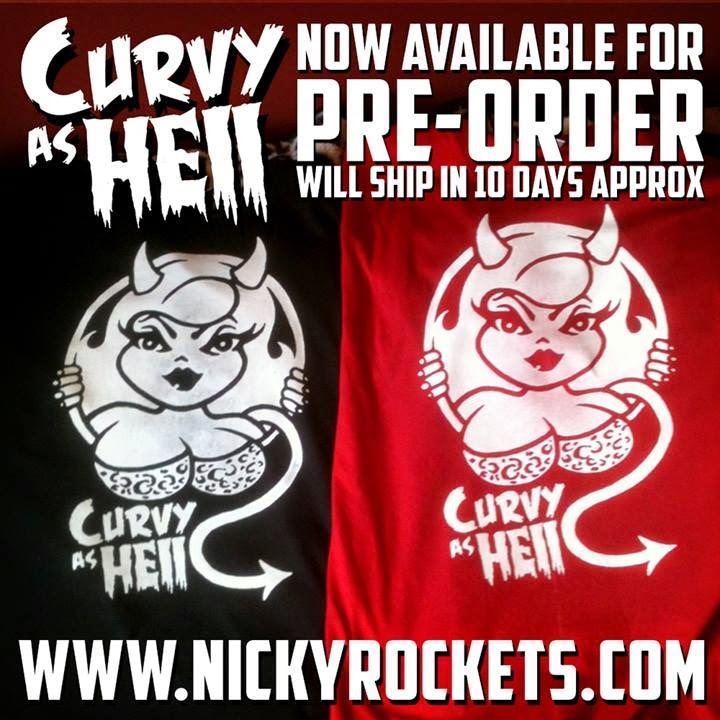 Check out my Plus size Teeshirt Range at Nicky Rockets where my Curvy As Hell is available to pre-order.